When I lived in America, I took classes in American Sign Language. By then I knew at least one (very small) deaf person. I loved the classes, but failed to make much progress. Undaunted, I started studying Irish Sign Language when I came back to Ireland. Years later, I can just about say hello, but don’t ask me to interpret what other people are saying. People sign fast in the real world–way faster than in the classroom. Still, I’m a great lover of sign. It’s a language of beauty and grace; of meaning made visible. I still hope to become fluent, but have years more study ahead of me. Meanwhile, I offer a little Christmas treat. Here is the choir of St. Mary’s School for Deaf Girls (Dublin) performing Fix You by Coldplay. When Jenny at http://readsbyredriverbanks.wordpress.com/ asked me to take part in a writing blog tour, I immediately said yes. But the more I thought about it, the less confident I felt. Writing about writing seemed an indulgence, or worse, an invitation to writer’s block. Still, I was curious about how blog tours actually worked. And I’d given my word to Jenny. So, I headed back to her site to see what I needed to do. Turns out I just had to answer some simple questions. Alas, minimal demands have never prevented maximum procrastination. First, I spent some time catching up with Jenny. She lives in Brunei, a part of the world I’ve never visited, and writes about her life and travels. Her writing style is relaxed and lyrical, and complimented by her wonderful photography. I can’t recommend her blog highly enough. Second, I decorated the house for Christmas. Third, I started to read The Victorians, A.N. Wilson’s 700-page history. I got as far as chapter four (‘Typhoon Coming On’) before stopping myself and remembering what I was supposed to be doing. And so, in the spirit of openness (and its sister spirit, not chickening out of things), here are my answers to the four questions that make up the Writer’s Blog Tour. I’m working on a collection of short, nonfiction pieces based on the lives of pioneering women. The women (pirates, adventurers, and inventors) led fascinating lives. Some of them were famous in their day, but their stories have largely been forgotten. Most of the pieces I’m writing are less than a page in length. It’s difficult to compress a lifetime into so few words, but I enjoy the challenge of working in tight frames. The trick is to find a natural ‘pivot point’ in each story that allows me to flash forwards and backwards in time. Sometimes I find the pivot point quickly, but other times it requires a lot of thought. Once I figure it out, however, I have a structure. The writing usually comes easily after that. The pieces read like flash fiction, but they’re all thoroughly researched and historically accurate. They can be read and enjoyed on their own, but I’m hoping some readers will use them as a stepping stone and learn more about these women. They really were remarkable. This blog is a side project, a chance to relax and enjoy myself. My first blog Hush was very structured: a post a month for one year. I was surprised by how much I missed it when it finished. I started Here and There a few months later. At first, I envisaged it as a chance to write lyrical, fragmentary pieces, but I’ve expanded a bit since then. Now I’m more open to trying different things (this blog tour, for example), and to allowing the blog to evolve. I’m a slow writer. I do most of my thinking before I start a project, and tend to write fairly deliberately. (Apologies, Anne Lamott.) The advantage is that my first drafts are fairly finished. The disadvantage is that my writing can be too controlled. Swings and roundabouts, really. For the pioneering women project, I spend a couple of weeks researching each woman. I try to read a full-length biography if available and any primary sources I can find. I let things percolate for a week or two before I start writing. I often find that researching one woman leads me to another. I love that sense of serendipity. I belong to a writer’s group, and I find the discipline helpful. Members are expected to produce something new each week. I can only make so many excuses before embarrassment sets in and I produce something. I write what I do because it interests me. Simple as that sounds, it’s taken me years to figure out. In the past, I’d see or read something interesting and immediately move on to the next thing. I craved stimulation, I suppose. Now I’m more inclined to pay attention to the moments my mind perks up, the little twinges of curiosity that occur throughout the day. I allow myself time to examine things that catch my attention. I’ve learned to honour that first impulse, to slow down and let the mind and the imagination do its work. I work mostly in creative nonfiction and the genre is pretty elastic. You can find wonderful writers using all sorts of techniques in CNF, so I think it would be difficult to come up with something completely original. At the moment, I’m interested in mosaic and braided essays. Mosaic essays depend on the placement of elements for their success, and braided essays wind two or more independent strands together to create a whole. I like the challenge of forms like these. I also like to bring material from a range of sources into an essay: excerpts from medical reports, historical archives, primary sources etc. It’s a bit like found art. Can I take these strange snippets and make something cohesive from them? And there you have it; a quick peek into the way I work. As always, the real value of a post like this is the opportunity to link to other wonderful blogs. Many thanks to Jenny at http://readsbyredriverbanks.wordpress.com/ for inviting me to participate. Jenny was nominated by Indah at http://indahs.com/; Indah was nominated by Allane Milliane at http://packingmysuitcase.com/; and Allane was nominated by Ting Dalton at http://my-travelmonkey.com/. I’ve been enjoying exploring these blogs and travelling the world vicariously through their lovely words and photographs. All highly recommended! Lastly, I’m delighted to nominate the following writers to participate in this blog tour. I’m always interested in hearing how other writers work, particularly writers I admire. I hold out the hope that their talent will rub off on me. Success by osmosis, right? I’ve been knee-deep in books this week. Inspired by who knows what, I emptied the bookshelves and piled my books on the floor. A quick calculation revealed the scale of the challenge: a thousand books – more or less — to be sorted into two categories: keep or give away. And so, I’ve been shedding books, filling boxes for the charity shop. And because we’re such a good team, my husband has been emptying those boxes and piling the books beside our bed ‘to read later’. The project has had one unexpected benefit. 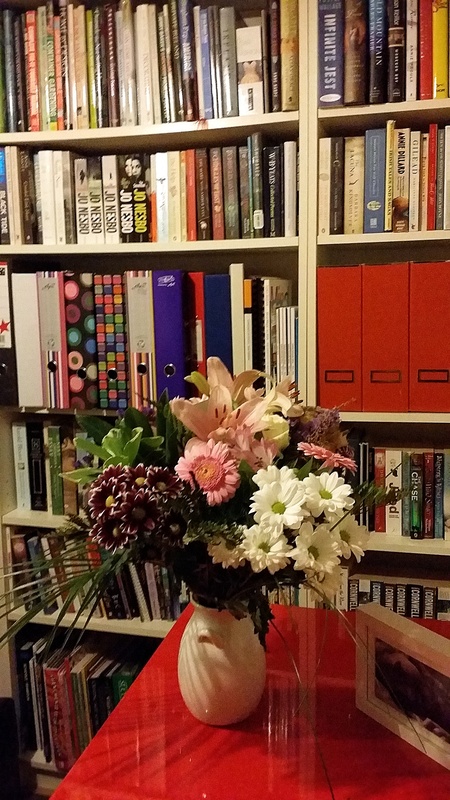 The lovely Ellen, who blogs at Always the Garden, asked me to recommend some books for writers, a request easier to accede to now that my writing books (at least, the ones that survived the cull) are gathered together on one shelf. Of course, recommending books is dangerous. I’m bound to have offended someone. But for what it’s worth, here are ten writing books I’ve found helpful over the years. Lamott is funny, and her self-deprecating wit is hugely entertaining. But she’s also honest and insightful. This is the first book I turn to whenever I lose faith in writing. Goldberg draws on the practices of Zen meditation to encourage careful observation and attention to detail. Short, stand-alone chapters are beautifully written. Still inspiring writers, almost thirty years after its publication. Writers have been doubting themselves for a long time. Ueland’s book, first published in 1938, is an exhortation to write anyway. A genial introduction to the basics of essay writing. Great place to start if you’re just beginning to write nonfiction. Good technical guide. Chapters devoted to fiction, poetry, magazine writing, and personal essay and memoir. Practical advice on structure and craft. Short and useful. 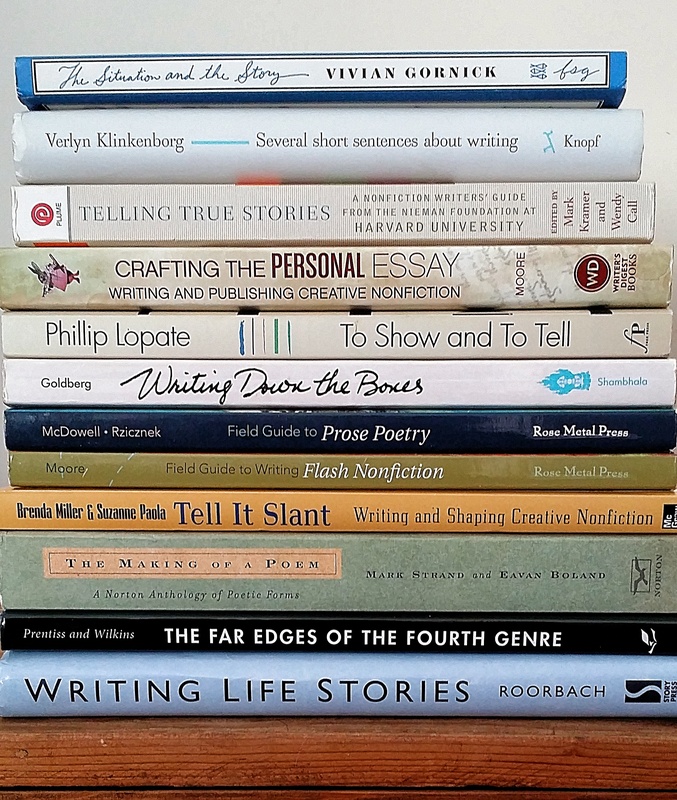 A simple guide to several forms of Creative Nonfiction, including lyric essays and braided essays. I come back to this whenever I need inspiration. Field Guide to Writing Flash Nonfiction, edited by Dinty W. Moore. Short essays by writers, editors, and teachers exploring the flash essay form. Includes exercises and examples. The Poetry Home Repair Manual by Ted Kooser. Gentle discussion of poetry for beginning poets and readers of poetry. Warm and conversational in tone. The Making of a Poem, edited by Mark Strand and Evan Boland. Clear definitions and wide-ranging examples of poetic forms, including the pesky villanelle. Lovely introductory essay On Becoming a Poet by the late Mark Strand.